Devoid of the wings and the cyclorama, a fully lit, deconstructed space greeted the viewer as they entered Zellerbach Hall. A red suitcase was placed amidst ample silver tinsel that had been strewn about the stage. Artistic Director, choreographer and performer Reggie Wilson entered, standing downstage right. He straightened his clothing, smiled at the audience and tossed wrapped candy out to them. In these opening moments, Wilson connected directly with the audience, and so right away, the line between performer and viewer had become porous. One by one, the company came out into the space, introduced themselves, announced what I assumed was their birthplace as well as giving a statement of time, which I again assumed was how long they had been working with Fist and Heel Performance Group. As “Go Down, Moses” scored the action, the cast assembled in a wedge formation upstage left, nodding their heads, while Wilson packed all the tinsel in the suitcase and rolled it away. He returned, and with the company, began harmonizing and vocalizing. From that instant, you knew that everyone onstage was a consummate interdisciplinary artist, skilled as movers, vocalists and percussionists. Moses(es)’ early choreography spoke of familiar motions and strong water imagery, water, of course being integral to much of the biblical Moses story. Performers walked, knelt and rolled in the space; bodies were ceremoniously laid down on the ground, like a baptism. Legs swam in the air and dancers dove into second position, lopping up an entity (presumably water) and then letting it go. Layered on top were recognizable gestures – pointing/following the horizon and cradling a baby. In preparation for seeing the work on Friday, I had read that questions of leading and following were intrinsic to Moses(es) and that exploration was so, so clear at many points in the seventy-minute composition. Mid-way through, a trio began dancing in unison and as their phrase material continued and accumulated, one would take over leading the group, then another, then another until each member of the trio was experiencing the choreography at their own pace, with no leader whatsoever. A later quintet had some similar qualities. Two dancers introduced a movement phrase; three more joined a number of beats after (in canon) and then eventually the five found their way back together in unison. A call and answer song, which was accompanied by a simultaneous physical pattern, was another example of this overarching query. A cyclical, circular entity with no starting and no ending, and consequently, no leader and no follower. Framed by a disco ball, each individual brought his or her own unique expressive dance downstage center to a song where the pervasive lyric was that of “follow me.” They played with tempi (sometimes speeding up, sometimes slowing down), choreographic style and genre as well as physical intensity. And a mathematical segment brought patterning and repetition to the table, though it was a bit on the long side and its connection to the whole of the work was a little lost on me. Near the end of Moses(es), cannoned movement sequences recurred, with the performers staggering the start of various choreographic phrases. The water imagery from the beginning also made another appearance with arms and legs swimming through the space, and the company once more pointing along the horizon. And in a fantastic cadence, Wilson asked the audience to join in with some of the singing and vocalizing right near the end of the work, engaging with the audience and again, breaking the barrier between viewer and performer. If there’s one thing that stays with you after a performance by Dance Theatre of San Francisco, it’s the company’s extraordinary artistic rigor – rigorous choreographic innovation, rigorous communication and interpretation of that choreography, rigorous technique, rigorous phrase material. On Friday evening, the much-lauded DTSF opened its 2017 Fall program, marking five years of contemporary artmaking, under the Artistic Direction of Dexandro D. Montalvo since 2015. With this mixed repertory fall program, DTSF confirms that the buzz in the dance community about their work is spot on. This is a company you need to see. The evening began with Montalvo’s Coovy-Two, a world premiere solo danced by Cooper Neely. Positional clarity combined with legato phrases; fluidity and precision concurrently flowed through the space. With locking isolations, open stances in 2nd and 4th positions, jazz influences, martial arts inspired movement, and even a textbook grand plié in 5th, Montalvo’s choreographic vocabulary was the epitome of dynamic. And Neely was absolute perfection – what a strong opening to DTSF’s fall home season. Next up was the one piece on the program from a guest choreographer, the world premiere of Angela Dice Nguyen’s Lady in Waiting, a quartet for the four women of the company. With gorgeous costumes reminiscent of the classic Isadora Duncan tunic (design by DTSF company dancer Christopher Dunn), clarity of shape, intention and position again reigned supreme, whether in a large pose, an extension, a simple hand gesture, an off-balance promenade or intense bicep shaking. Even as the dancers walked from one place to another, their focus was so striking, not one moment of ambiguity. My sense was that there was a narrative fiber running through Lady in Waiting, with instances of lightness and joy alongside more serious, somber moments. But it was the specificity of the movement and physicality, both in the choreography and in the dancers’ performances, that drew me in. Closing the first half was the only returning piece on the program, Montalvo’s Impulse from 2014. A charging beat framed the luscious quartet for DTSF’s four men. Again the intense choreographic breadth sang from the stage – equal parts serpentine legato sequences and percussive staccato work. And the way that these two states were crafted together was something to behold. It was like a stream of physical consciousness that compelled attention. Your view was fixed on the stage, not wanting to miss a single detail. Each millisecond of the dance was that special. Following intermission came the final world premiere on the program, Montalvo’s Broke(n), an ensemble work for the entire DTSF company, and one that existed in the beautiful in between spaces, a physical essay of haunting extremes. Very dramatic right from the start, one dancer is lovingly presented with a rose only to have it snatched away by another. Then, the entire cast erupted into a theatrical wonderland, dancing with expanse to “My Favorite Things” from The Sound of Music, their purposely pasted-on smiles masking what was underneath. Then the music shifted from the ‘putting on a happy face’ vibe to one of anguish, and a motif of the hands covering the eyes was introduced, one that would recur throughout Broke(n). Mid-way through the work, one dancer cycled through a lengthy solo while seated on a chair, signaling restrictions and constraints. Slowly, the rest of the performers brought their chairs to join him in a collective expression of camaraderie. Eventually the choreographic statement moved off the chairs and into the main space as the original soloist watched with a distinct sadness. The extremes continued, the hands over the face recurring as well as the notion of collectiveness, this time expressed through group embraces. And at the end of the work, the rose is again taken away from the very first dancer, who subsequently begins to pick up flower petals that had been strewn around the stage. While the whole may have still been elusive, there were parts of the whole that were available and present. With such specificity on stage (even the bows after each work were so clear and defined), it was a little surprising that some of the program’s format logistics were a bit off – a very late start and a major lag between the first and second pieces, though no one was changing costumes and there was no alteration to the stage environment. In addition, there was no announcement saying that the curtain was being held or notes in the program to expect a significant pause between works (though important to say that the transition between Lady in Waiting and Impulse was very quick). These observations may seem pedantic and picky, and perhaps they are. And I’m the first to admit that delays are a personal pet peeve of mine. But when presenting concert dance, these details matter. And they matter, not because they take away from any of the choreography or the performances, but because they affect the overall flow of the entire program. 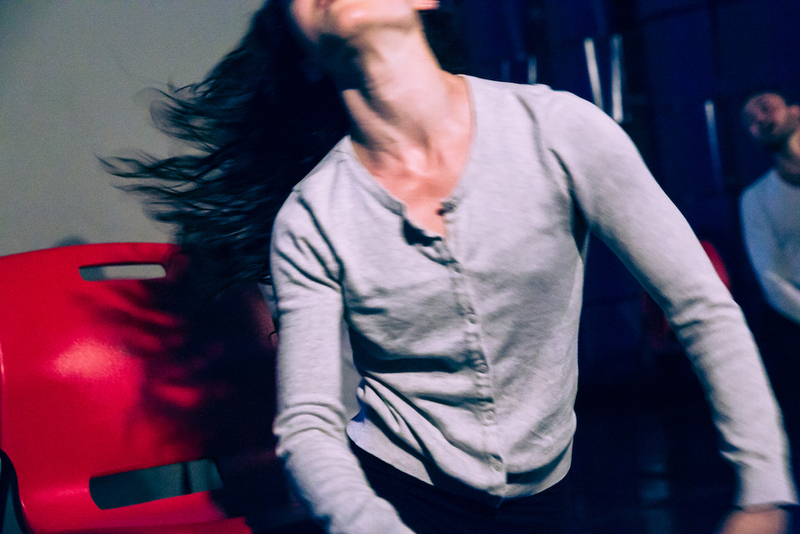 Six dancers explored the ODC space, walking with equal parts ease and determination. Each appeared to be on their own individual circuit, though occasionally, would meet. Some of these interactions took the shape of a simple circular pattern while others were more complex – one body leaning forwards or backwards in space, while another took that weight and rebounded it back to standing. The scene felt task-based and the movement, familiar and accessible. These were the opening moments of Obstruct & Connect, by choreographer Alyssandra Katherine Wu and danced by the Alyssandra Katherine Dance Project (AKDP) this past summer at ODC Theater. A mixed repertory quadruple bill, the program, entitled Brace Forward, joined three works by AKDP with a special offering by guest choreographer Carly Lave. As Obstruct & Connect continued, the walking pathways gave way to a duet downstage right. While a video projection (by Clare Schweitzer) framed the action, the falling and catching motif repeated, accumulating force, speed and intensity. Then an entirely different duet emerged, still holding the weight of the body as its foundation, but with much fuller, lush choreographic material. This eventually grew into a full ensemble statement of athletic, through-expressed physicality: large extensions and level changes, all informed by a sense of suspension and release. The solos, duets and trios that followed built on this choreographic foundation, adding in unexpected acrobatic walkovers and impressive dives and falls. The program notes for Obstruct & Connect share with the viewer a question that was at the heart of the piece, “what happens to a contact dance when one or more partners stop the conversation by only giving weight rather than receiving?” This study of weight was very apparent in Obstruct & Connect; a highly successful communication in both the choreographic intention and in the company’s sharing of the work. Having said that, I find it a challenge to understand improvisational practices and formal, structural inquiries around improvisational practices within a performative container. Not particularly in this work, but more in general. I’m not saying that they don’t fit together, not at all. But the relationship and conversation feels very blurry to me. Certainly something to keep thinking about, and Obstruct & Connect provides another opportunity to consider. Another Time was up next on the Brace Forward program, a narrative-inspired, mixed discipline work that, with its strong creative contrast to Obstruct & Connect, demonstrated Wu’s artistic breadth. A montage of family photos (video again by Schweitzer) unfolded on the back screen. A soloist, Ying-Ting Hsu (Gama), sprang from one pool of light to another around the stage, each instance introducing a distinct physical idea and emotional charge. With blackouts in between, this opening sequence felt just like the photomontage – glimpses of one moment in time. And as the lights rose fully, the choreography similarly whipped around the theater. Next, the video morphed into images of Hsu dancing amidst natural environments, and she responded to those images, slowly bending her upper body backwards in space until it reached the ground. While Hsu remained in this posture, the text of an oral history conversation took over as Another Time’s score, telling of a deeply personal life journey. Hsu’s legs walked and swam through the air, moving from one attitude to another, as gripping words spoke of unimaginable circumstances. Slow, meditative gestures brought Hsu back to standing, her sweeping legs and swinging arms intimating defense and running. And so striking was the fact that the choreography was not interpreting the text, but instead responding and reacting to it, and as the audience, you began to realize that this kind of real-time dialogue (between movement and sound, between movement and video, between movement and light) is what had been happening all along. Such an astonishing performance by Hsu, not only in terms of narrative depth and technical acumen, but also in stamina…conquering a sixteen-minute solo is quite an accomplishment. Lave’s Mimesis also brought a narrative slant to the Brace Forward program, though from a more conceptual and deconstructed perspective. Her program notes say this, “Mimesis explores forms of imitation and representation through the politicized site of the female body.” The ten-minute trio, danced by Brianna Torres, Jane Selna and Madison Doyle aptly reflected that intention. The incredibly fluid movements and seamless transitions in the work cannot be ignored, though what spoke most in the choreography was its externality. In line with outside, imposed perceptions, expectations and assumptions, Mimesis’ phrase material came from that same place – external impulses. From the first long arabesque extension that went so far out in space it had no choice but to flex into an attitude to the subtle port de bras to the use of wide second position in plié to the rolling spines, the vocabulary was a reaction to external stimuli. An outside force attacking the solarplexus brought on falls; the performers violently brushed their thigh muscles, ridding themselves of a controlling obstacle or barrier. 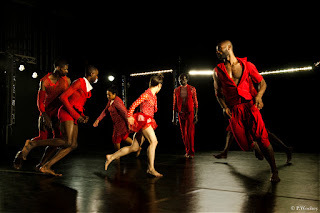 If Obstruct & Connect was about structural composition queries while Another Time and Mimesis focused on narrative connective tissue, the final piece on the Brace Forward program was all about the movement, pure physicality. Wu’s Glass Ceiling paired pedestrianism, tasks, gestures, athletics, partnering and even martial arts-inspired steps with her penetrating contemporary choreography. 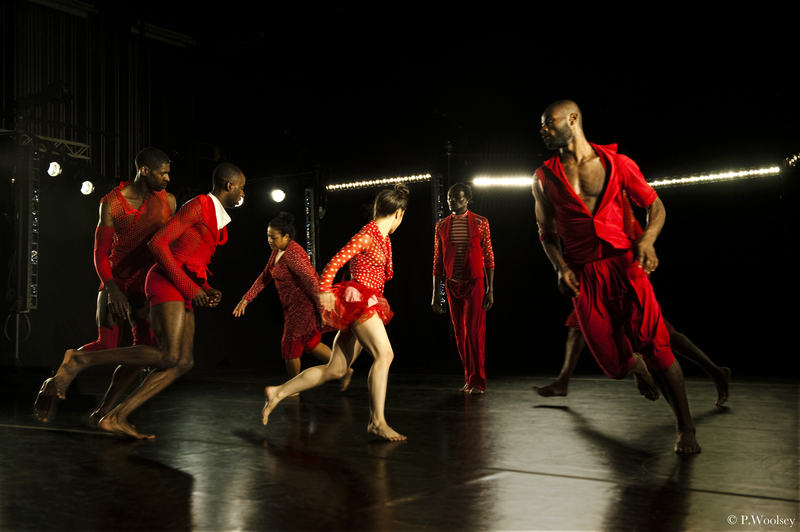 Each of the six dancers appeared to take a turn as the constant in the piece, taking the jump rope located upstage and with it, providing a metronome-like measure, almost like a heartbeat. In the main stage space, the ensemble would cycle through the vast variety of movement styles and genres. And Wu mined these styles with additionally attention to different tempi – from the allegro of the first floorwork solo phrase to the slow controlled adagio of the later cluster formations. Contemporary creators have innovation in their blood, constantly pushing and testing the artistic landscape. Whether through choreographic language, performance sites, collaborative devices, technological elements, narrative content or structural form, they mine for newness over and over again. FACT/SF has long been part of that tradition, committed to growth, new approaches to physicality and transforming the notion of performance. In addition, the company, led by Artistic Director Charles Slender-White is a pioneer in arts programming, seeking to identify the needs of artists and of the field, and working to develop and create series and residencies that respond. They championed JuMP, Just Make A Piece, encouraging choreographers to do just that, create work without constraints or expectations. And this past weekend saw the debut of another landmark project, a joint venture between FACT/SF and LACDC, LA Contemporary Dance Company, under the Artistic Direction of Genevieve Carson. PORT, or Peer Organized Regional Touring, is a brand new platform, hoping to make touring more of a reality for small/mid-sized dance companies and encourage artistic dialogue between regions. PORT’s inaugural edition features shared quadruple bills in both San Francisco and Los Angeles (at LA Theatre Center) during the month of September. All four of the works on the San Francisco program at ODC Theater were premieres, two world premieres from FACT/SF and two San Francisco premieres by LACDC. In the first and third pieces of the evening - an(n)a.07, a solo choreographed and danced by Slender-White, and excerpts from Carson’s Stimulaze – the relationship between music and movement was paramount. As the lights slowly rose on an(n)a.07, J.S. Bach’s complex contrapuntal sound penetrated the space. Slender-White began a short movement motif, which eventually grew and developed, accumulating more and more intricate phrase material. There were moments of charged stillness, coupled with intensely strong technical positions (a deep lunge in fourth position) and living postures, including a phenomenal grand plié, also in fourth. Bach’s fugues and inventions have certain structural elements present – a subject, sometimes referred to as the theme, answers and countersubjects – all of which are woven together to create one large, cohesive compositional statement. In an(n)a.07, a title which aptly includes the name of Bach’s wife, Slender-White was brilliantly demonstrating how present-day live choreographic material can act as one of these structural elements - a relevant, contributing independent/interdependent voice, conversing in real-time with a score composed hundreds of years prior. Carson’s quartet, Stimulaze, also began with the music of the Baroque master, J.S. Bach, and again, we witnessed an artistic back and forth, though here it was between four dancers performing different strands of movement. In Carson’s theatrical container, the quartet overlapped and intersected, and while each choreographic idea was distinct, all shared an incredible fluidity and legato intention. Very much like the score. Then things shifted. The four dancers began purposely bumping shoulders, pulling and pushing each other backward and forward in space. And the music morphed as well, this time into work by W.A. Mozart, a composer synonymous with 18th century classicism, where music composition was very much about following specific rules, formulas and formats. In this part of Stimulaze, the choreography was acting against that structure. The dancers were playing a game of will, exertion and control (and a humorous one at that), refusing to ‘stay in their lane’. Stimulaze’s juxtaposition of movement working with the music and then conversely working in opposition to it was extremely satisfying. The remaining two works, EBBA (LACDC) and Remains (FACT/SF) took the audience on a journey, a descent into the mysterious land of the deconstructed narrative. Neither told a linear story, but both were very clearly steeped in and inspired by the human condition. A pounding, vibrating bass line shook the entire theater as the LACDC dance artists entered one by one from opposites sides of the stage for EBBA. They toggled between stretchy, undulating slow motion positions and quick, traveling, transitional steps. An animalistic-like growl was layered into the score, similarly mirrored in many of the choreographic postures. Forceful dynamic changes and jazz-based phrase material leapt from the stage, the movement creating an atmospheric sense of purposeful uncertainty and insecurity. And there was a very clear extreme being explored – that of the individual and the collective. At the beginning of the piece, it felt like each dancer in the eight-member female ensemble was navigating their surroundings on their own. Inhabiting the same space as others, but not with any kind of kinship. As EBBA progressed, this isolation and lone-ness was replaced by a sense of the group, of the collective. Speaking of the group, the LACDC company dancers had excellent spatial awareness, able to be completely in the moment, fully committed to the movement with no collisions. And they were able to do so without making the ODC stage look crowded. The only challenge in the piece was the score, or more specifically the booming bass pulse in the score. It might have just been the size of the theater, but everything was shaking pretty intensely for almost the entire dance, and it did distract a little from what was happening visually. Six FACT/SF company dancers made their way to the stage, each carrying a plastic 3D shell mannequin figure of themselves. Once these shells had been distributed around the space, the ensemble made their way to upstage right to begin Remains’ first movement phrase – a choreographic expression of sweeping arms and legs told along a circuitous path. As they arrived in place, the mood radically changed. Slow contorted motions and screeching vocal sounds unfolded; the theme of anguish ringing clear. Structurally, Remains channeled repetition and accumulation devices, with highly physical motifs overlaying each other. And for a good portion of the work, the cast faced the back of the stage. This facing brought egalitarianism into the picture – the dancers could have been anyone. Mid-way through Remains, the performers squirmed on the floor trying desperately to make it to a seated position on a chair. Once they finally accomplished this task, they violently fell to the floor with percussive and rhythmic full body physicality. And they would try again, make it, and then lose once more; succeeding and falling, succeeding and falling, succeeding and falling. This was interspersed with a clock-like shaking of the head, in a ‘no’ attitude. The shells would come back toward the end of the dance, in a nurturing, protective sequence, complete with LED lights that were breathed into the structures. But for me, it was the chair sequence that felt the essence of Remains. The continual up and down signaling the never-ending, relentless cycle of human emotion and the blindsiding power of grief and angst. Developed as part of the Resident Artist Workshop (RAW) program at SAFEhouse Arts in 2017, Edifice: Breaking Walls is all about asking questions. From challenging the perimeters of performance spaces to upending the relationship between performer and audience to expanding and deepening collaborative processes, Edifice seeks after new understanding. Textural dimensions abound throughout. Natural materials like wool, fiber, paper, canvas and cloth interact with texturally diverse choreography. Delicate petit allegro – wispy glissades, sissones, pas de chats and beaten jetés – meet task-based, gestural phrases and pedestrian running. Turned out extensions are broken into flexion by the lightest, most subtle impulse. Dancers on pointe and dancers in flat shoes perform side by side. And the partnering sequences toggle between traditional pas de deux and unconventional points of contact, like the top of the head. As the lights rose on Type None, performed at West Wave Dance Festival 25 last September at Z Space, a young boy sits at a table stage right demonstrating the procedures associated with insulin injections – a tedious, painful, relentless reality of life with diabetes. On the other side, a male dancer turns in repeated fouettés before moving about the stage in an expansive, lush solo full of extensions, spins and batterie. Voices of children affected by the disease ring through the air as solos, duets, trios and full ensemble statements unfold. Early on, the boy rises from his chair, joining in a repeated port de bras sequence. Later he pushes and pulls the dancers out of the way, exerting will and control. At other moments, he sits center stage, silent and still, mesmerized by the movement. Is he watching a representation of the cells within his body? Is he imagining freedom from constraint? Is he picturing himself at different points in his life? While two very distinct dance works, Edifice: Breaking Walls and Type None share a number of commonalities. Each performance work is informed by curiosity and discovery, a deep desire to look beyond held assumptions through rigorous creative exploration. Both will have another life this coming fall, at separate events the weekend of October 13th-15th. And they are both conceived and composed by choreographer Lissa Resnick, Artistic Director of No Strings Attached Dance Company. A serious ballet student from a young age, Resnick spent summers at Joffrey, Sacramento Ballet and San Francisco Ballet and was invited to attend the full-time pre-professional program at SFB, an intense schedule of classes, workshops, rehearsals and performances. While fully committed to this demanding course of study, at the same time, Resnick was aware that the total immersion-ness of pre-professional life was somewhat limiting, at least for her. After being sidelined with an injury, she, like many dance students, began to feel a pull toward other interests, other pathways, particularly to math and science for which she had always had a passion. And so, Resnick shifted gears away from full-time ballet and enrolled in UC Davis, pursuing a Bachelor of Science degree. While these undergraduate years signaled a break from pointe work, dance was still part of the picture. In fact, Resnick used this time to investigate different forms of movement and physicality, eventually joining Bonnie Simoa Contemporary Dance Company (which was affiliated with UC Davis), under the direction of Bonnie Simoa. This foray into contemporary dance would be a formative period, as it would continue to influence and be present in Resnick’s artistic journey. Type None directly lives into that desire, a work that brings the medical and performing arts communities together. Created in partnership with the Juvenile Diabetes Research Foundation (JDRF), the ensemble piece for eight dancers and one youth actor is a personal one for Resnick. “A couple of years ago, my son was diagnosed with Type I diabetes and Type None is about caring for a child with chronic illness,” she shares, “the JDRF really stepped up and supported me through this process.” A big effort over the past year (it premiered at West Wave in 2016), No Strings Attached will be performing an excerpt from Type None at the upcoming Juvenile Diabetes One Walk, East Bay, being held on Sunday, October 15th in San Ramon. On the Friday before (October 13th) at Coffee Shop in Lafayette, No Strings Attached will be making another appearance in the East Bay, dancing Edifice: Uncovered as part of the inaugural Art Moves Project. Resnick is wearing multiple hats for this event, both as a co-founder of the organization and as a commissioned artist. “Art Moves looks at bringing more progressive movement and dance into the community, engaging with and reaching out to the audience,” Resnick explains, “it’s a public art initiative that will have multiple locations in Lafayette, right in the hub of the downtown walking areas.” After receiving an initial grant from the Lafayette Community Foundation, Art Moves Project commissioned their first creative endeavor, Edifice: Uncovered, a collaboration between Resnick and visual performance artist Marcia Barrow Taylor. For this next chapter in the Edifice story, Resnick is contemplating the question of “what lies beneath the surface; what’s inside.” In addition, the piece is taking Resnick outside of her comfort zone. Though informed by the primary question above, Edifice: Uncovered delves more into the abstract side of dancemaking, in terms of form, structure and composition, and away from traditional storytelling. With No Strings Attached’s strong commitment to mining the unknown, it is no surprise that Resnick is venturing into this new terrain with Edifice: Uncovered.